The mini ball is a 9-inch pliable pilates/yoga fitness overball similar to the ones found in gyms, physical rehab clinics, and yoga training centers. Great for Pilates, yoga, balance and core training, weight training, flexibility, and resistance. Perfect for Pilates mat workouts and your inner thighs! 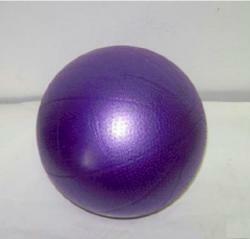 Ball comes in a purple color and is easily inflated by mouth and does not require a pump. Perfect for travel and portability!